In our modern, foodie world where there are several television networks devoted to cooking and the most watched non-soap on regular television is a baking competition, it’s easy to laugh at Dream Topping. But in the 1960s, many of us didn’t have a fridge, so keeping cream cold – and therefore not allowing it to go off – was difficult. Fresh cream was expensive – most dairy products, other than heavily subsidised milk, were expensive before we joined the EEC – and even middle class families couldn’t justify the spend on something so ephemeral. And whipping cream, although it existed, was a nightmare to use as mother had to either spend ages beating it to get it to rise or put it in the Kenwood Chef, where a moment’s inattention meant you suddenly had expensive sweet butter. 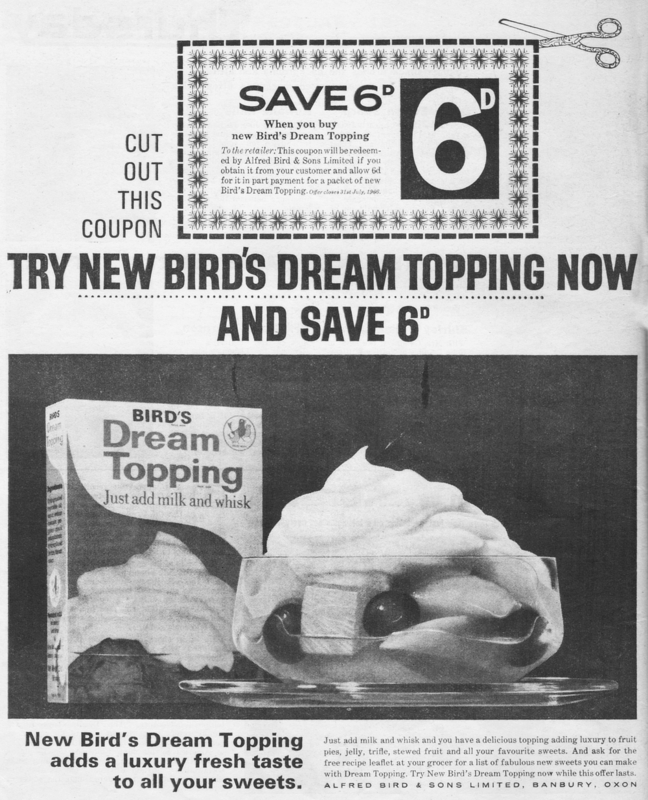 Bird’s Dream Topping took all these problems away. Being shelf-stable, it could sit in the larder or pantry effectively for ever, pulled out to add a bit of excitement to tinned peaches or a fruit salad. It was cheap, compared to fresh cream, so middle class households could have it always available and poorer households had it within reach for birthdays and special occasions. And it didn’t take all that much whisking – still a chore, but much less than with whipping cream and much easier to shove in the Kenwood and get on with opening the tinned fruit. So don’t laugh at Dream Topping: it served an important purpose!